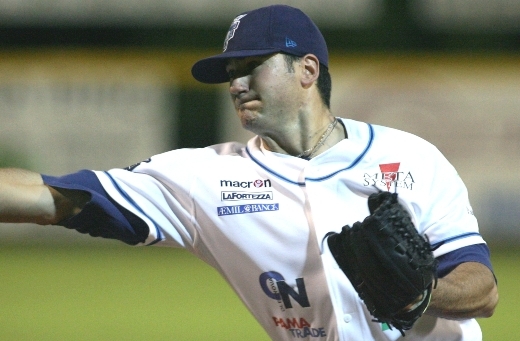 Right-handed pitcher Cody Cillo is returning to the reigning Italian champion Fortitudo Bologna. The 29-year-old came to Italy in 2006, joining De Angelis Godo for two seasons before going to Bologna in 2008. He also was supposed to take the mound for Fortitudo last year, but after pitching for Italy in the World Baseball Classic he decided to stay in North America. Cillo joined his former club Calgary Vipers, but got hit hard, allowing nine runs on twelve hits and six walks in eight innings for the Golden Baseball League team. Born in Brunswick, Maine, Cillo attended Edmonds Community College and the University of Alabama before signing with the Florida Marlins organization as an undrafted free agent in 2003. He pitched two seasons in the minor leagues as a reliever between Rookie and Single-A ball. In 2005 he moved on to Calgary, which still played in the Northern League that year. Twelve months later he was in Italy. In three years Italian Baseball League he went 19-12 with an ERA of 2.60 in 47 games (two starts). He struck out 234 batters in 305 innings, walking 109. Whispers of his return to Bologna stayed alive throughout the winter. Fortitudo is planning to use Cillo together with Yulman Ribeiro in game two each week, maybe even giving him some starts according to a report by Baseball.it. He also gives them important depth for the European Cup. Bologna opens the new season on April 1st against the Godo Knights. Ryan Murphy leaving Pioniers for Taiwan?